Organic flax seed oil, organic sunflower seed oil, organic sesame seed oil, organic evening primrose seed oil, algal oil (Schizochytrium sp. ), organic coconut oil, organic rice bran oil, organic soy lecithin, rosemary leaf extract, high oleic sunflower oil, tocopherols, ascorbyl palmitate, organic oat bran oil. Organic flax seed oil, organic sunflower seed oil, organic sesame seed oil, organic evening primrose oil unrefined DHA algae oil (schizochytrium sp. ), organic coconut oil, rice bran oil, organic soy lecithin, rosemary extract (preservative), organic oat germ, bran oil. The cloudy layer in the oil is unique to this blend. To obtain its benefits, shake bottle gently before each use. Take 1 tablespoon or more a day with meals (up to 1 tablespoon per 50 pounds of body weight per day). 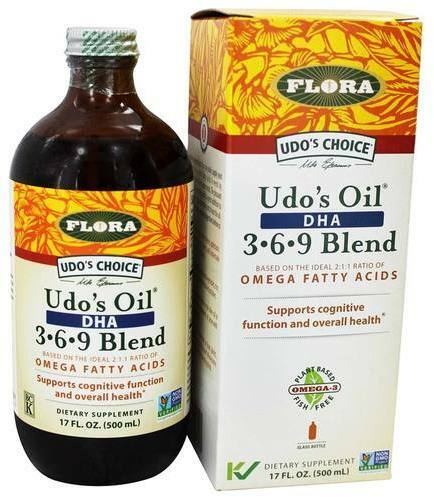 For best results substitute other sources of dietary fat with Udo's Oil. For optimum freshness keep refrigerated. Do not heat or use for frying. Once opened use within 2 months. Udo's Oil can be frozen to maintain freshness for longer periods. 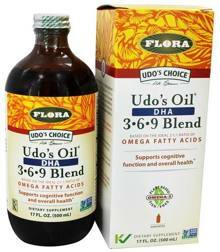 Udo's Oil DHA 3-6-9 Blend is an excellent vegetarian source of DHA (Docosahexaenoic Acid) (algae-derived). DHA is an omega-3 fatty acid that is essential for the proper functioning of our brains as adults, and for the development of our nervous system and visual abilities during the first six months of life. Supportive but not conclusive research shows that consumption of EPA and DHA omega-3 fatty acids may help reduce the risk of coronary heart disease. Organic flax seed oil, organic sunflower seed oil, organic sesame seed oil, organic evening primrose oil, unrefined DHA algae oil, organic coconut oil, rice bran oil, organic soy lecithin, rosemary extract, organic oat germ and bran oil. The cloudy layer in the oil is unique to this blend. To obtain its benefits, shake bottle gently before each use. Take 1 Tbsp or more a day with meals (up to 1 Tbsp per 50lbs of body weight per day).